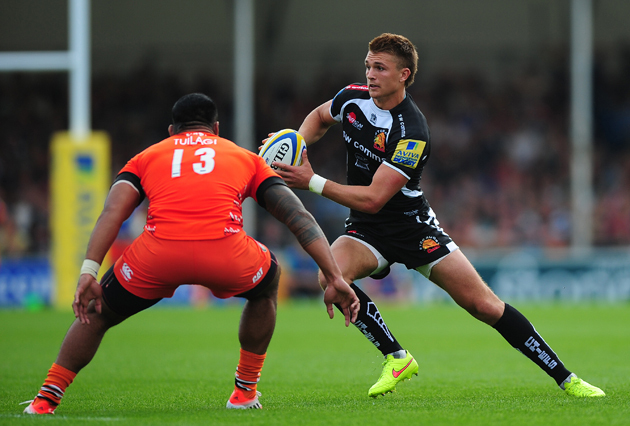 AS CHRISTMAS rushes towards us, what are the standout stories in this season’s Aviva Premiership? No one expected London Welsh to be so utterly out of their depth, and those routs for Leicester (0-45) and Harlequins (0-39) were pretty sensational. But the story so far has to be the resurgence of Exeter Chiefs, who petered out last season to finish eighth and now sit second, two places and three points above this weekend’s illustrious opponents Saracens. They’re the Southampton FC of rugby’s top flight. Few saw this coming, certainly not Stuart Barnes, who in Rugby World predicted an 11th-place finish for the durable Devonians. So how has it come about? There’s surely more to it than a metaphorical sobering up after their LV= Cup celebrations last March. “More than anything it’s about time,” says Rob Baxter, head of the coaching team that this week signed new contracts tying them to the club until 2018. “Seventeen of our regular match-day 23 have only just played their first full season. Ben Moon and Jack Yeandle in the front row, Dave Ewers, Ben White and Kai Horstmann in the back row, Damian Welch at second-row. It’s all the way through the team: Dave Lewis, Henry Slade, Jack Nowell, Sam Hill. If time brings cohesion, it also brings perspective. According to Baxter, some observers lost sight of Exeter’s true standing in the fog of the win-loss columns. “People forget that the difference between winning and losing can be very fine margins,” he says. “Last season we lost seven Premiership games by one score, four or five of them by one point. In six of those seven games we were leading into the second half. The thundering Thomas Waldrom, the league’s top try-scorer, has proved an inspired signing after he was discarded prematurely by Leicester. But the most significant personnel change has been a positional one, with the decision to field two first receivers, Gareth Steenson and Henry Slade, in the same line-up. Last season they vied for the No 10 shirt. “Being able to field two first receivers, two kickers, two decision-makers who see space and communicate it, all helps. The back-line we have now has been made possible because of Henry’s fantastic defence – it’s what stands him apart from a lot of other players. The Chiefs aren’t alone in selecting two natural tens in their back-line – Leicester, London Irish, Gloucester and Newcastle have all done so recently, not to mention England – but they do it better than anyone else. It helps that Slade is left-footed, but Exeter are particularly adept at switching play in midfield, keeping their options open to attack either side of a breakdown instead of going wide early. Their kicking, set-piece and out-to-in defence have all improved and they’re learning to back up emotionally-charged performances. After winning at Northampton, the next fixture with Wasps was just the banana skin that previously would have tripped them. Not now. Crucially, too, their game management is showing signs of the maturity needed to notch those wins. Too often the Chiefs have coughed up soft points by being penalised when running and recycling the ball deep in their own half. A dash of pragmatism was needed and we’ve seen it this term, though not, says Baxter, because of any directive from the coaches. Rather, it is natural evolution, because with experience comes better decision-making. And with teams expecting Exeter to run from everywhere, sides have left space behind the line for the Chiefs to kick into. 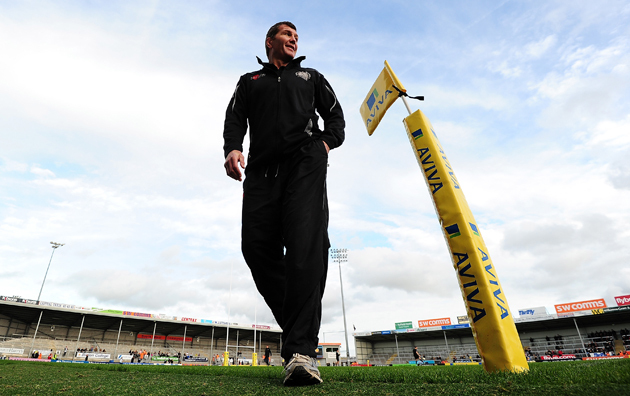 Exeter’s running ethos is firmly intact, however, and they remain a joy to watch and a beacon of positivity for the game at large. “To be successful as a club, you need something different in your DNA, something to hang your hat on,” says Baxter. “We try to play with ambition and score tries. There are reasons for that and number one is that I want to work with players who enjoy what they’re doing. We want to play to win matches, and train to improve, not play to avoid relegation and scrape through games 6-3. Exeter have won just two of their previous nine meetings with Saracens, but the visitors have stumbled a little lately whilst Exeter are on a five-match winning streak in all competitions. Only Leicester have won at Sandy Park this season. “Our games against Saracens are always humdingers. They have tremendous physicality and are a very hard-working unit. They pride themselves on not making mistakes and a lot of their qualities are ones we like to instil in our own team.